Prep Day: In large bowl, beat peanut butter, cream cheese, and sugar until creamy. Fold in 3 cups Cool Whip. Spoon mixture into crust and smooth to edges. Remove 2 tablespoons hot fudge from jar and reserve in zip-loc plastic baggie for later. Heat remaining hot fudge according to package directions. 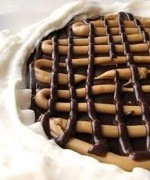 Spread on top of peanut butter layer. Refrigerate pie until serving time. Spread remaining Cool Whip on top of pie. Knead hot fudge in baggie with hands; cut tiny hole in corner of baggie and pipe over pie. Repeat with 2 tablespoons peanut butter and pipe on pie in opposite direction. Wrap carefully and freeze. Serve Day: Soften slightly, cut, and enjoy!